For sale.. 57 foot narrow boat .. cruiser stern .. built in 2001 by GT BOAT BUILDERS ..fitted with a Beta Marine Diesel engine.. Finished in a beautiful blue over black and totally refitted internally to a very high standard.. it’s fully self sufficient and ready to move onto .. as a weekend retreat or a floating apartment.. the total living space is 44’ and on entering the vessel you are met instantly by the high standards throughout..Down the steps there’s beautiful grey laminate flooring that flows through the whole boat.. on your left is the toilet room (thetford morning round porta loo.. next to that is a full size shower with thermostat fittings.. go through to the open plan kitchen/living room.. there’s a brand new fitted kitchen with solid oak worktops and breakfast bar.. white gloss doors.. matching bar stools and a full size washing machine.. however we have not fitted a job/oven/cooker into the kitchen as someone may prefer has or electric depending on their intentions.. but I can fit any appliances at prospective buyers request… following onto the living room.. it’s very tastefully decorated and includes a tv.. 3 seat sofa.. storage boxes and a lovely free standing log burner.. onto the bedroom and you will find a full size raised double bed.. matching triple wardrobe and drawers.. so plenty of storage.. 6 volt lights throughout and 240v hook up installation.. 2000w inverter and battery charger.. the hot water is heated via an electric immersion heater or via the engine.. so you are fully self sufficient.. so all in all a top grade boat ready to move aboard.. only selling as my lad wants to fund a world trip.. boat safety certificate valid 2020.. full survey done in 2017 of which the paperwork can be viewed.. genuine people only please.. no bids or offers will be accepted or discussed until any prospective buyer has viewed the boat.. and buy it now price offers will get the same response.. payment will be by bank transfer.. and the boat will be transferred to you when the funds are cleared.. thank you .. 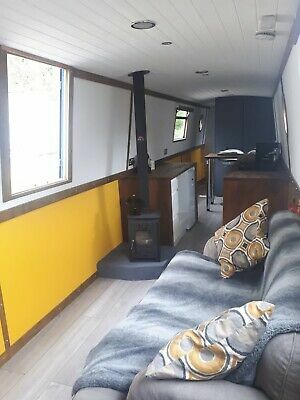 This Narrowboat 57’ Floating Apartment boat is located in Nottingham, NG16 4AA and is being sold on eBay by buzzbetts.